If you’re thinking about one of our energy-efficient systems for your home, your taste is impeccable—and so is your timing. After all, you don’t want to spend another season wishing you had a better home comfort system. Installation and Claim submittal must be completed by July 31, 2019 by 6pm CST. Contact us for complete details! † Subject to credit approval. Contact a participating Carrier dealer for more details. Consumers in the U.S. and Canada are eligible for the Carrier Cool Cash promotion. This promotion is designed specifically for the residential homeowner market. 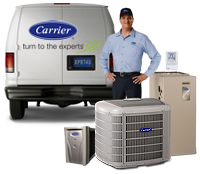 Only Carrier systems sold as a replacement for the homeowner's existing system or as an add-on to an existing home qualify. Turn to us for complete details on all rebate offers and financing options, subject to credit approval.